Mac Gambill is the co-founder and CEO of Nudge, LLC. As the CEO, Mac wears many hats, but his primary roles consist of business development, fundraising, and sales. In his time with Nudge, the company has been recognized as finalists in programs such as RVA Companies to Watch and the Chattanooga Technology Council's Early Innovator Award. Mac was recognized by CIT as being a GAP 50 Finalist, which identified Virginia entrepreneurs most likely to build the next generation of tech companies in the state. In Q1, 2015 Nudge launched a complementary platform for health coaches, called Nudge Coach, that leverages the Nudge technology to streamline the coaching process and help coaches better manage larger client populations. Nudge has also launched Nudge+Coach, introducing an on-demand coaching network to complement the mobile health ecosystem, allowing consumers to combine the benefits of their wearables data with a real-life health coach. What we can now do with digital offerings and digital models that a lot of businesses are interested in is tap into audiences that are outside driving distance from the club. With mobile health, clubs can not only extended their business reach outside the four walls, but also dramatically increase their target audience - which yields greater financial success while helping more people in their health and wellness. Mac believes that the data is showing the collaborative care model is growing, with the convergence of fitness and health care, both in the private side with concierge medical groups with membership models and also by fitness pros collaborating with healthcare professionals to create a new environment around the consumer and the client. Mobile health technology in and out of the fitness industry is already changing lives and poised for growth. 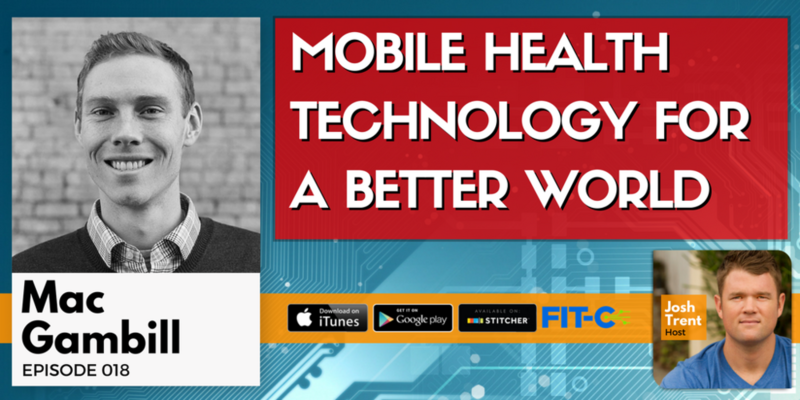 Mac believes that mobile health is a large piece of the puzzle, but what needs to occur to use this technology for a healthier world is the rise of the tech enabled fitness professional who uses strategic communication with their clients. The data is great, but data without contextualized feedback is just not effective.